Devils Lake - Every angler from second place to last place applauded the winner of the recent National Walleye Tour held on Devils Lake. They did so because he towed his Lund 2075 Pro-V 1,300 miles to get to a lake he had never fished in a state he had never visited. They did so because he is the youngest person ever to win a major walleye tournament. They cheered his honest and sincere approach to the competitive game. They did it because he’s a nice guy. During the days leading up to the tournament, Dylan fished rocky points and humps with bottom bouncers and Northland Butterfly blades. The best blade color was yellow. He searched for other rocky bottoms and while watching his Lowrance electronics, eased over some deep-water with rocks. At 40 feet, he saw not only rocks, but many big fish lounging among them. Tis NWT win was not a fluke. Dylan has fished tournaments and experienced many lakes, reservoirs, rivers and Great Lakes during the past 10 years. After High School, he enrolled and graduated from welding school. He was employed at a welding and fabrication company. He quit his job to pursue the big league walleye tournaments, but said, “This is a great company. They asked me to come back to work after the summer tour ends.” He already has seminars and sport shows booked and wants this win to be the catapult to a career in the fishing business. “It’s my dream,” he said. What’s interesting is that veteran tournament pro angler Jim Carroll, Minot, North Dakota, who has fished Devils lake often, found a very similar pattern. The deep fish were new to him also. He said, “I never caught such big walleyes so deep.” Jim used an AquaVu HD underwater camera that allowed him to visually see the bottom and the fish. He knew exactly what was down there because he was watching a 12-inch live TV picture being broadcast in real time on his Lowrance graph of everything on the lake bottom: rocks, fish, but no mermaids. “It seemed like I was watching the bottom for 10 hours every day before the tournament. What I saw was hundreds of walleyes. I learned how they related to rocky areas and how to trigger them to bite.” He split time with Rapala Jigging Raps and trolling with lead core. The number 9 Jigging Raps were best. 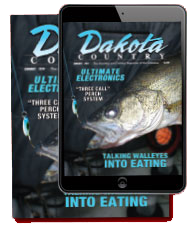 His other tactic for walleyes holding in the 40-foot depths was lead core 200 to 225 feet behind the boat with a 12-foot leader of 14-pound FireLine. This produced the remainder of his five-fish limit on day one. The lure of choice was a Berkley Bad Shad trolled at 2.2 mph, with occasional bursts of speed. “Yeah, I would have liked to win, but third place was OK. I really like that Dylan at such a young age took home the winner’s trophy. We need more young guys like him on tour. I know I will be on Devils Lake soon, and it wouldn’t surprise me to see him pull up alongside me one day,” Jim said. 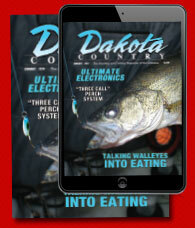 Devilslakend.com includes details about Devils Lake motels and resorts, guide services, fish cleaning stations, water levels, ramps, public fishing piers, fishing reports for walleye, pike, perch and white bass, community activities and upcoming events, dining, casino and much more. Or call the Tourism office, 701-662-4903. Devils Lake is open year-round for some of the best fishing in the United States.